Modern readers can understand ancient Romans’ men and horses pitted against each other, betting, winning and losing. 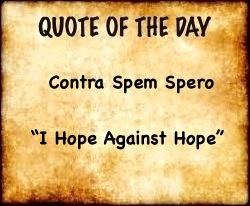 We can understand the Circus Maximus. What is impossible for us to understand is their blood sport. Not the drawing of blood during sport, but the spectacle of humans led into a sports arena to be torn to shreds by wild animals or forced to fight to the death while tens of thousands of people are watching, cheering, taunting, eating, talking and laughing. Emperor Trajan looked down at the man in his seventies who was clasping iron chains around his stomach. 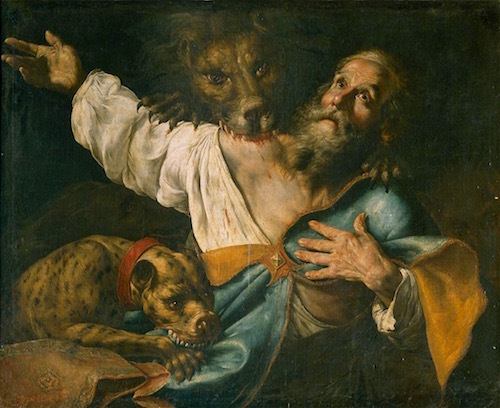 “Who are you, wicked wretch, who transgress our commands and persuade others to do the same so that they should miserably perish like you will?” he growled. Trajan asked the scribe to hand him the list. He began to read the names of the people who were coming before him that day. This old wretch in front of him was supposed to be the leader of an unruly group in Antioch called Christians. 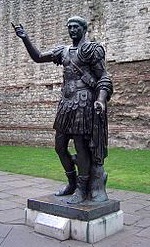 Trajan was fresh from his victories over the Dacians ((101-102, 105-106 Romania/Bulgaria). 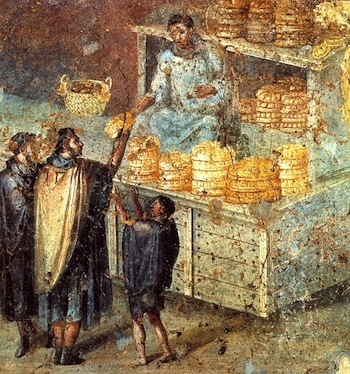 While he was in Antioch taking care of this type of local business, he had instructed 80 million cubic yards of earth and rock be removed from Quirinal Hill in Rome in order to construct the Forum of Forums to celebrate this victory. At his death (10 years after Ignatius’ trial), his ashes were set into the base of the 125-foot column topped with a statue of him. 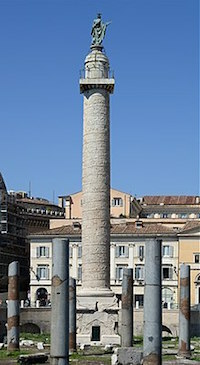 Trajan’s Column (right) is still standing. Powerful and omnipotent, the conqueror Trajan was confident he could deal with these commoners who were defaming the gods all over his empire. His Procurator in Antioch had been lobbying him to come to his city for some time. “Carry Him in their heart!” Trajan smiled and leaned forward. “So you are saying you carry within you that Jesus who was crucified. That’s not believable. 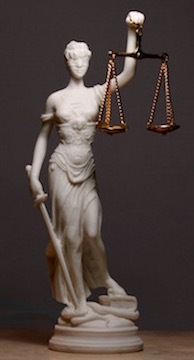 How can you carry a god within you?” The emperor stood up and pointed to the marble statue of Justitia (left). 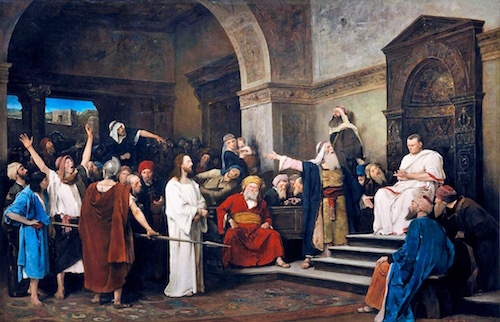 News of the Bishop of Antioch’s inspired eloquence and boldness before the emperor and of his death sentence spread swiftly throughout the nascent Christian communities in Asia Minor. 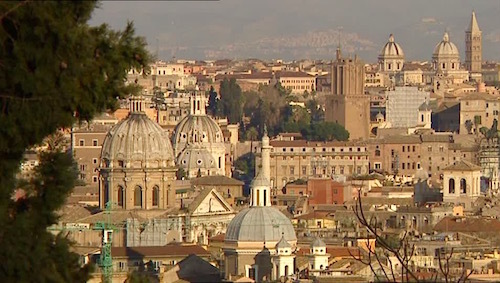 All along the journey to Rome, Ignatius was greeted by Christians who comforted, encouraged and rendered homage to him. 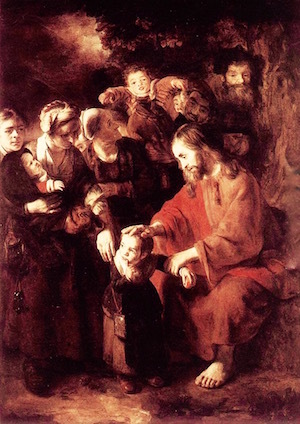 Ignatius called himself Theophorus meaning in Greek “God-Bearer” because Jesus had taken him as a young child into His arms. By this appellation, Ignatius witnessed to that event and to the God within his heart. 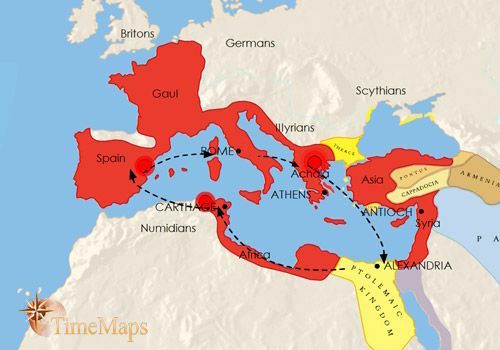 The trip to Rome with the Roman soldiers was grueling for the older man. 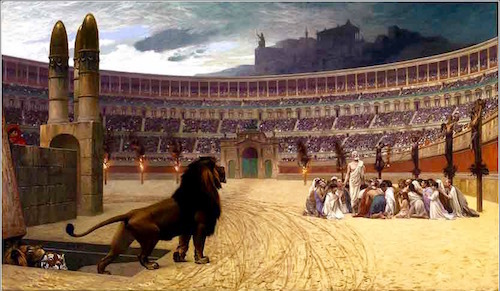 In one of Ignatius’ letters he says: “From Syria even to Rome I fight with wild beasts, by land and sea, by night and by day, being bound amidst ten leopards…a company of soldiers who only grow worse when they are kindly treated.” The long journey with rough Roman soldiers prodding him on was a training camp for his contest in the Colosseum and he knew it. 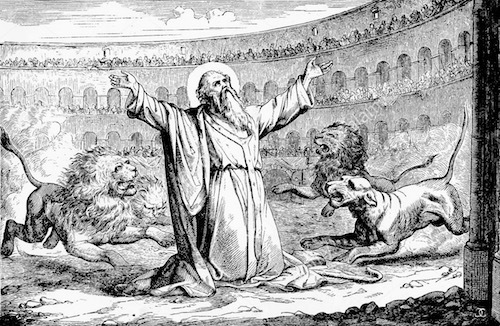 When Philo and Rheus claimed Ignatius’ body, “only the harder portions of his holy remains were left.” The lions had eaten all of him except his bones. His friends wrapped the gnawed bones in linen and took them back to Antioch. His relics were removed to Rome in the 7th century where they reside under the high altar in the Basilica di San Clemente.